HOW BAD IS THE DEVIL? 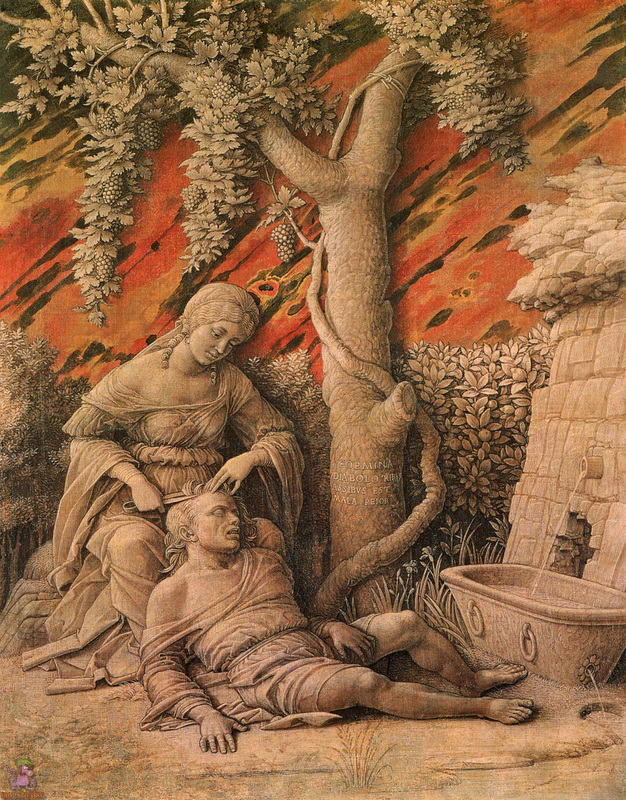 At the very end of his life, Andrea Mantegna inscribed the answer to the question on the tree in this delicate cameo-painting of Delilah snipping away at Samson’s hair — as if the fountain next to the tree weren’t clarification enough. If it’s hard to read the words on the tree, you can click on the tree itself to read them more easily — and if that’s still not enough you can click yet again on the bigger picture. Then it’s a piece of cake — that is, the riddle’s a piece of cake, not the beautiful, dignified, introspective young woman trimming the hair of her grizzled, old, pumped-up and psyched-out lover, the act that reduces all men to the divine fools they are destined to be. Because the Divine Fool is the true message of the Samson story, it seems to me, that is if you read the details of the story very carefully — or, alternatively, if you carefully and exhaustively read your own life, or even read me if you know where to look — which is why I am writing what follows, to find out. I’m going to leave some space on that now, for reflection. My reflections on Mantegna’s dictum, foemina diabolo tribus assibus est mala peior, are developed day by day in the Comments below, and if you are interested in such things I hope you will be able to read them with as much hope for an answer as I posted them. On the other hand, if you’re impatient you can skip ahead to a specific discussion of HOW BAD IS THE DEVIL IN THE END. But fasten your seat belts as you scroll down, because jumping ahead is going to make for a very fast ride! And those of you who start at the beginning, be warned as well: the discussion that follows thrives on hair-pins and other sticky corners, and very often paints itself into untenable places as well — I do hope you’ll be charitable and forgive me for all the dead-ends. I’m an Old Father William, and all I can tell you is that this is how it goes. Indeed, that’s part of the riddle of knowing where you are in the space you inhabit, and it doesn’t much matter whether it’s on earth, in space, buried in your own person or in some other idea or dimension, or perhaps even suited up in a New Age space-vehicle transitting infinity to arrive where you actually are, like in Carl Sagan’s Contact. Wrapped up in your own cocoon like Eve, in other words, even if you’re a man and not yet ready to be that beautiful, powerful, and fey. Or a snake with your own tail in your mouth like Satan in the Garden of Eden — indeed, you may even be impatient enough to want to go straight to the discussion for men and women who are no longer inhabitants of the Garden of Eden but would like to know what really happened back then. ……….1.) CLICK HERE TO START AT THE BEGINNING OF THE END. ……….2.) CLICK HERE FOR THE END OF WHAT WAS ACHIEVED IN THIS THREAD. ……….3.) CLICK HERE FOR THE SECOND TO LAST POSTSCRIPT. ……….4.) CLICK ON THE END OF HIS NOSE TO SEE HOW EVERYTHING GOES. THIS THREAD IS CONTINUED IN THE COMMENTS THAT FOLLOW.